The Lord’s Prayer was never meant to be said by hurried lips. Instead we should see each line as scaffolding to build our prayers around. Let me suggest how you might use it as a roadmap for your conversations with God. 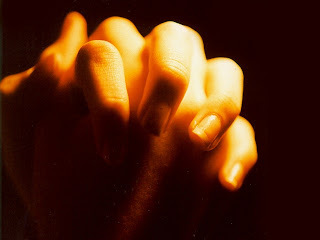 Start your prayer with both hands clenched. This represents the things we want to bring to God, the things we care about, the things we are holding on to. The right hand represents the God-ward request of this prayer. Then as you release your pinkie look for ways you might experience and express God in your world. on earth as it is in heaven. The left hand represents the us-ward request of this prayer. As you release your left thumb register your heart’s concerns with God; both big and little. Give us today our daily bread. As you open the longest finger on your left hand, remember that God desires His forgiveness to reach into all the relationships of your life. Ask for a forgiving spirit. as we also have forgiven our debtors. Then as you release your pinkie pray for His protection from all that would be destructive in your life and lives of those you love. but deliver us from the evil one. Notice how this prayer ends: with both hands open. You started with two clenched fists full of all of your cares. And along the way every one has been released. And now you are ready to receive all God has for you.